Overview: My goal for the Veterans Memorial Bridge is to transform it into a destination for the residents of Cleveland. I want to honor the history of the bridge by bringing back a traditional rail line, while applying it in a new and innovative way. Cantilevering the trolley rail on the side of the bridge not only allows for more space to be utilized on the bridge, but will give better views to the passengers aboard. 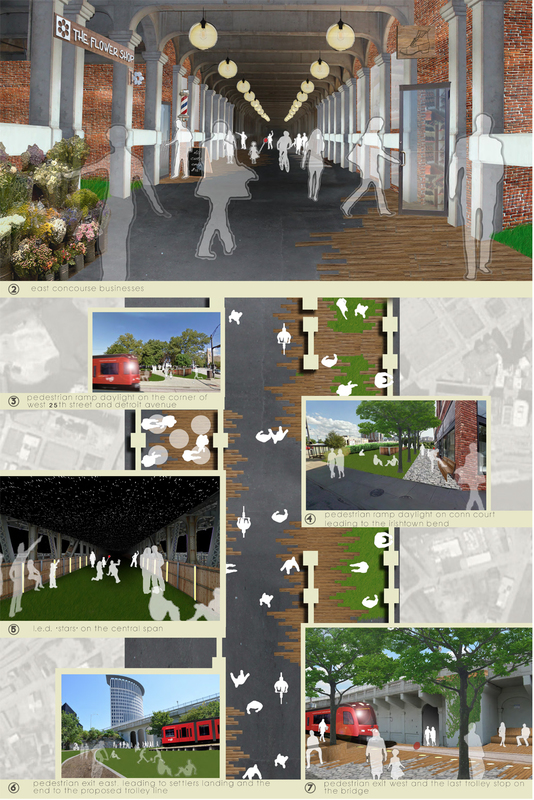 Pedestrian access was also a major consideration for my design concept. Currently, the bridge has only three accessible entrances for pedestrians, and they are not located in very convenient spots. I propose daylighting the old trolley ramps in strategic areas, to allow for better access from several different directions. These pedestrian access points better connect the districts of Cleveland to the bridge, and to each other. 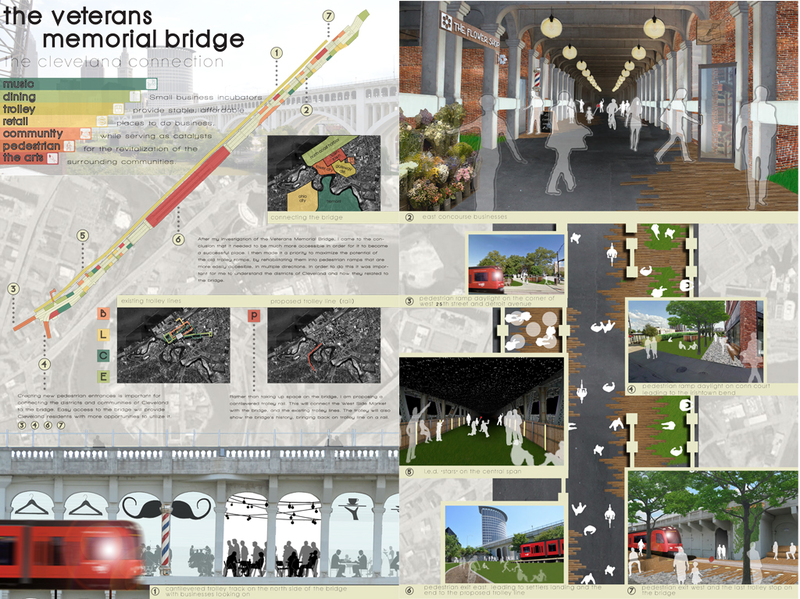 The programming proposed on the bridge is a series of buildings, with open space scattered throughout. Building uses could be community, music, dining, retail, or the arts, but should be evenly distributed throughout the space. 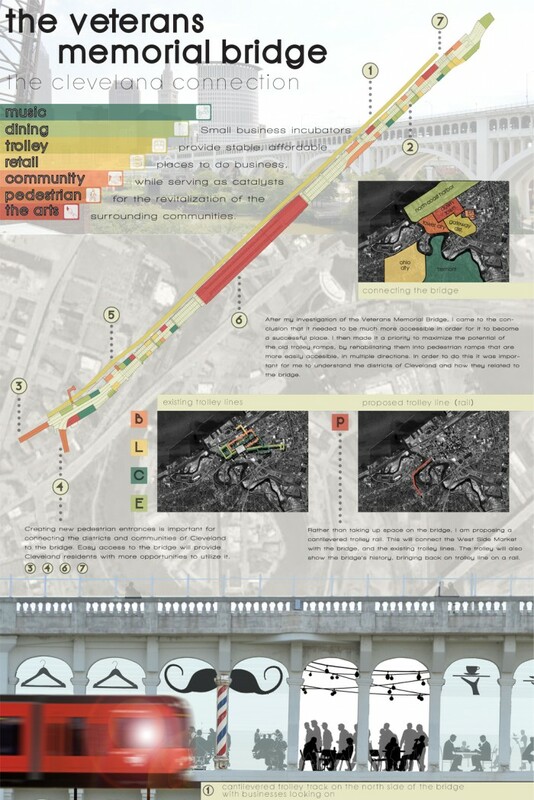 This creates a vibrant, active place that contributes to ClevelandÕs economy and the revitalization of the urban neighborhoods that surround it.